In a recent telephone survey by Edison Research and Arbitron, 2,020 Americans age 12 or older answered questions about their social, mobile, and television habits. Social awareness has reached ubiquity in the US: 93% and 90% of Americans have heard of Facebook and Twitter respectively, even though only 85% of Americans have internet access. While the number of Americans using social keeps growing – 56% now have a social profile – the rate of growth is slowing. Frequency of use, however, is only increasing. About one in four Facebook users check their account at least five times daily. And four in 10 Twitter users check the site every day, with 29% using it several times daily – up 11% since 2011. Twitter users are also becoming more active. In 2010, only 47% of users actually tweeted, but today, 76% post updates. 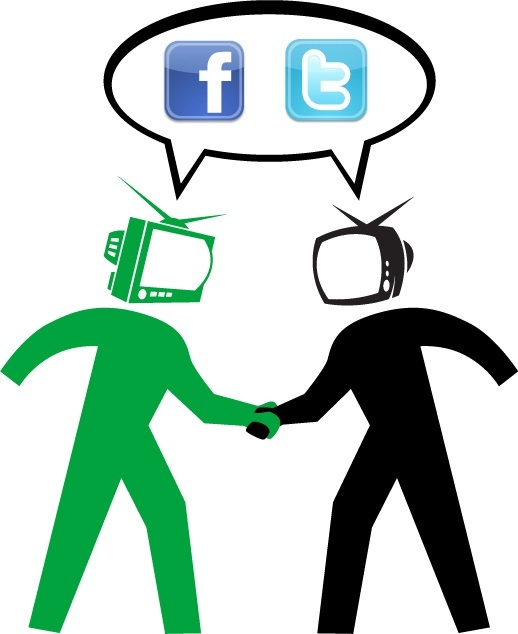 Social media is permanently changing the way we interact with television. The tube may still be the “first screen” for Americans, but social users are more likely than the general population to watch TV in non-traditional ways like online and via mobile or tablet. Forty-seven percent watch TV on computers, compared to just 27% of non-social viewers. Social networkers with DVRs bring the control they have over social content to their TV experience – 36% say they use DVR almost every time they watch TV. And 83% say they skip commercials nearly every time. Mass media’s embrace of social (especially Twitter) may be helping to boost our social TV habits, as more programs display fan tweets and adopt official hashtags. Eighty percent of Americans have seen tweets in other forms of media, and 43% say they hear about Twitter almost every day. Social let Americans connect with anyone, and theoretically, anywhere. It seems once we get a taste of this hyper-connectivity, we want to bring it with us everywhere we go. Social users are far more likely to own smartphones, tablets, and e-readers than general Americans; 61% own smartphones. Over half (51%) use mobile devices to check social networks, and a third (31%) check social via mobile several times a day. A third (31%) of Facebook users actually access the network primarily by phone. Social use also correlates to the way we prefer to communicate. When they can’t communicate in-person, social Americans prefer texting (45%) to calling (36%). The general population, on the other hand, greatly prefers phone calls (64%) to texts (21%). The share of Americans following brands on social sites has more than doubled since 2010, from 16% to 33%. As Americans connect with more brands, privacy concerns have increased as well – 29% say they’re at least somewhat concerned, a big increase since 2011. Facebook rules social brand connections – 79% say they use the social network most often to connect with brands. Nearly half (47%) say Facebook is the social site that influences their buying decisions most. And the number of respondents who said no social site influences their purchases fell from 68% in 2011 to just 36% today. Over half (56%) of people following brands on social networks say they’re following for sales and coupons, but the strongest brands in social tend to have higher percentages who say they’re following for content and ideas. Social media has changed the way we interact with brands, the media we consumer and each other and this impact is only going to grow as we continue to tune on, log in and talk a lot. Are Your Sales People Damaging Your Brand?